On Wednesday 9th January, we were treated to a summer tasting at Nostimo Greek Restaurant. 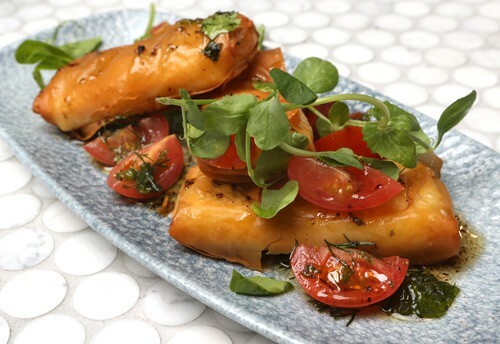 For those who are fans of Greek cuisine will be delighted with some of the creatively crafted menu items coming from the mind of head chef David Tsirekas. It was a fun night share with members of the Brisbane community, and even had former Bronco, Queensland and Australian rugby league star, Sam Thaiday in attendance for the night. So, when you hear food like “Haloumi Filo with truffled honey and rosemary” or “Pork belly baclava” sparks immediate intrigue as to how good this possibly taste. The newly developed restaurant situated upstairs at the Greek Club in South Brisbane introduces Greek food, utilising not only modern cooking styles, but it also takes a deep look into traditional ingredients and cooking techniques from ancient times throughout Greek history. Chef David provided all of us on the night his background, and the approach taken to create Nostimo Restaurant’s signature menu. Did you know? Nostimo means ‘Delicious’ in Greek? This…this was my favourite dish that I had on the night and I have to tell you, it tasted absolutely amazing, and I would go as far to say that the pork belly baclava may be the best tasting food experience I’ve had in recent months, maybe even over a year, and even as I am typing this out, I think back while salivating with the taste firmly burnt into my memory. This is almost my perfect desert, sweetness and tasty haloumi cheese. We actually had several servings of the filo, which for those who know Kenny, does not eat a lot of sweet food and desserts – but this was fantastic! The slight additional flavour of the rosemary really gave this some kick or x factor, and while it does not sound like it would match – it undoubtedly made the taste so much better. 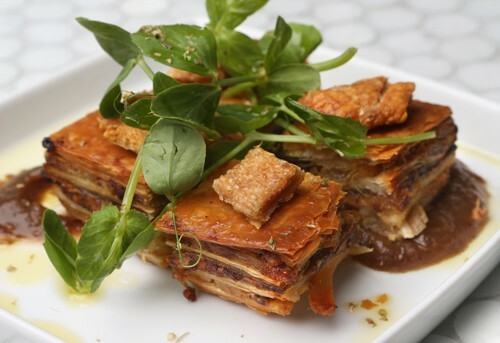 Creatively delicious Greek cuisine from traditional and modern Greek cooking styles.